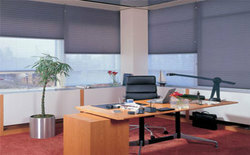 the duette blind has a unique honeycomb pleat, which allows the cord to be hidden within it, unlike the single pleat which has cords visible running through the fabric. in the winter it keeps the heat in and in the summer keeps it out using the same technology as double gDuette Blindslazed windows, it can also change the acoustics of a large area by dampening the sound echo and has the added benefit of looking stylish. a wide array of patterns are also available in this range that matches the décor of the house.